- Apply directly to the affected area of the scalp. - Do not apply to damp scalp. 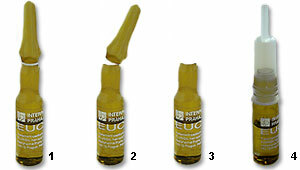 - Avoid contact with water after application of EUCAPIL®. Thus, wash hair as late as possible after application to give EUCAPIL® a maximum chance to work. Carefully snap off the top of the prescored ampule by applying a minimal amount of force. Place applicator tip on the open ampule. Apply in front of a mirror. With the head tilted back to facilitate its distribution and to prevent exposure to the eyes, apply EUCAPIL® directly to scalp (not to hair). With ampule in an inverted position, apply in a circular motion while repeatedly squeezing the applicator. The recommended use is one ampule (2 ml) per day, applied on the scalp at bedtime. One ampule (2 ml) contains isopropyl alcohol, Vitis vinifera (grape seed oil) and fluridil (CAS 260980-89-0). 30 ampules, each containing 2 ml. Store below 25 °C. Keep out of direct light.